• Real Open World - Players can travel to pretty much anywhere and will rarely experience a loading screen apart from instanced dungeons. • Tradepack System - Players can transport tradepacks to make money, they can only carry one in their backpack, but can carry more with vehicles and gain more money the further they transport them, even across the land in caravans or across the ocean aboard ships. • Piracy PvP - As part of the Tradepack system players can also play the role of bandit or pirate, attacking other players trying to transport tradepacks and stealing them for themselves. • Skill Based Characters - The game has no fixed classes and players can choose from 10 Skillsets such as Shadowplay and Sorcery making a stealthy mage assassin! • Court and Prison - Stealing crops, killing the same faction, and other crimes can land you in front of a court of real players who pass sentence and give you a Prison sentence (isolated in prison for a number of minutes depending on your crimes) where you can break rocks to reduce your sentence! • Regrading - Gear has 12 grade levels and players can improve their grade/quality, which has a higher % fail rate the higher the grade and can even destroy items. However, players can pay real cash for "Charms" that increase your chance of a successful regrade, forcing players to spend money to upgrade without potentially losing gear. • Endgame Gear $$$ - So many of the materials needed for crafting high tier gear can only be purchased in the cash shop. • Limited Real Estate - There's lots of land in the game, but there's only such a small portion of it allotted to player housing/farms and so whilst housing is a big feature it is one that most players can't take full advantage of. 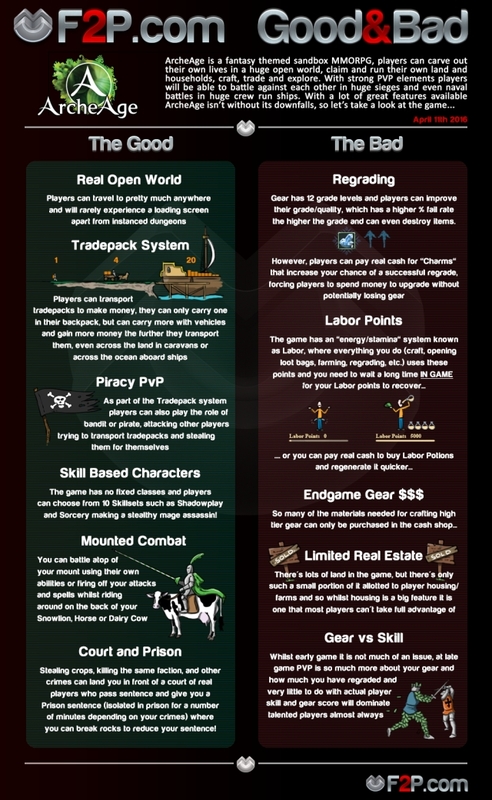 • Gear vs Skill - Whilst early game it is not much of an issue, at late game PVP is so much more about your gear and how much you have regraded and very little to do with actual player skill and gear score will dominate talented players almost always.